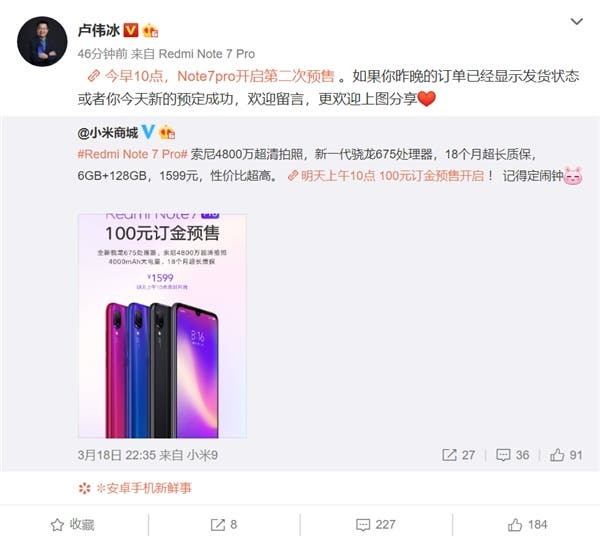 Today, Lu Weibing, vice president of Xiaomi Group and general manager of Redmi brand, announced that the Redmi Note 7 Pro opened pre-sale at 10:00 this morning and it is selling for 1599 yuan ($238). One of the biggest highlights of Redmi Note 7 Pro is its 48MP Sony IMX586 camera. 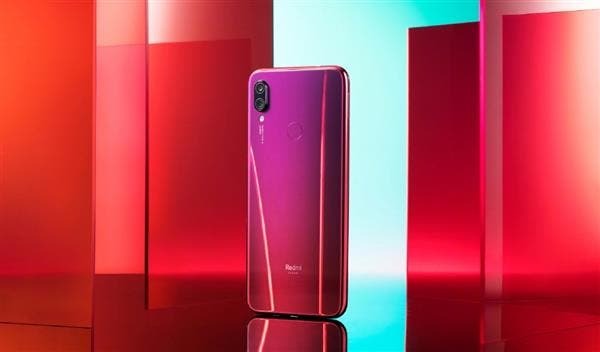 According to Xiaomi, this device and Xiaomi Mi 9 comes with the same handheld super night scene algorithm. Simply press the shutter button and the camera automatically takes multiple high-quality images. The camera also supports high-sensitivity mode, which combines 4 pixels into a large pixel of 1.6μm and it outputs a 12MP high-quality night scene picture. In the core configuration, this smartphone uses a 6.3-inch drop screen with a resolution of 2340×1080. It is equipped with a Qualcomm Snapdragon 675 mobile platform, equipped with 6GB of RAM and 128GB of storage. It also has a front-facing 13MP camera and a battery capacity of 4000 mAh. In addition, the Redmi Note 7 Pro enjoys an 18-month long warranty. The smartphone adopts a nano waterproof coating technology. It comes with a uniform water-repellent film on the surface of the mobile phone such that when the water accidentally splashes on the surface of the device, it simply slides off the phone.